Hello! 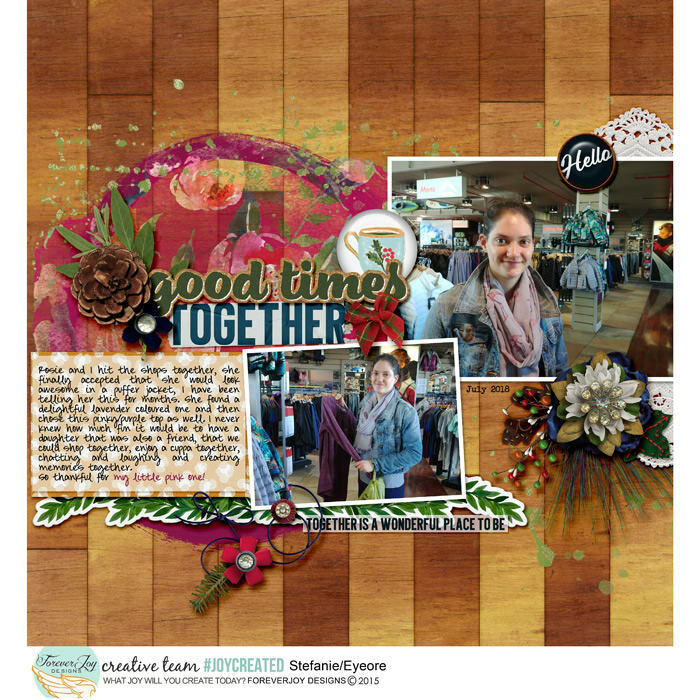 Stefanie here again on the ForeverJoy blog sharing with you three different layouts that use the same creative team friendly template by Fiddle Dee Dee Designs, with three different kits by ForeverJoy Designs. My daughter and I went shopping for a puffer jacket for her to wear in our winter now, but also for our planned overseas trip this December, so Wintery type kits would work well, not only that, she is wearing a scarf that features flamingos and ForeverJoy has the cutest kit on sale for Christmas in July that has flamingos and penguins, who could resist that adorable combination? My first layout uses Open House, which has a lovely traditional Christmassy/Wintery feel, and the layout design also stays fairly true to the template design. Because we live in South Africa, our Christmas is in the middle of summer, so I need an excuse to use cold weather Christmas kits. I clipped a gorgeous floral paper to the paint in the template because I call my daughter Rosie (her second name) and after having two sons I just love the fact that I can go wild with pinks and flowers on her layouts. Even though this layout features Christmas-style elements it comes across with more of a Wintery feel. I love that Renne’s kits are so versatile that you can do a shopping layout with what others may see as only Christmas kit. 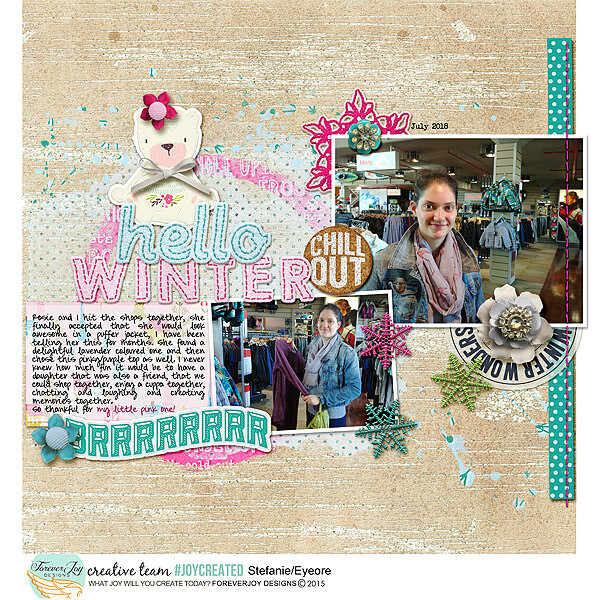 For my second layout, I used Beary Cold and then played up the cold and wintery aspects of our shopping trip. She may remember me having a “warm moment” and standing in the chill room within the shop for a couple of minutes to cool my flaming cheeks down. Still my hot flash is not something I want to journal about on my layout – but she will remember all of these fun details about our outing together. I played with the pinks and blues, in the papers and elements, loving the cute feminine bear, adding a flower and bow for the pop of dimension and because a big part of the creative fun I have when scrapbooking is adding these cute touches. 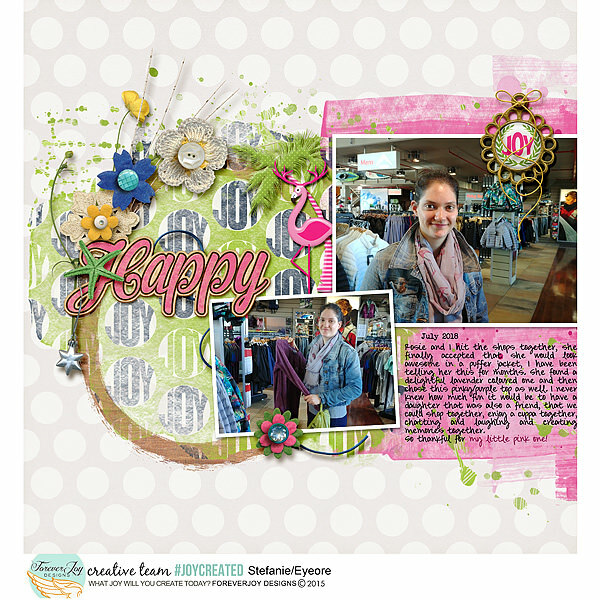 For my third layout I changed up the design, forgoing the journal block and adding the details onto a pink painted block with the Huladays kit. Her scarf is so cute and even though we “share’ scarves this one is hers only. Again, this kit could be used for a summery Christmas and yet by cutting out the holidays from the Happy Holidays wordart I remove the specific festive feel and focus on the emotion we experienced. This is the most simple of the layout but still my favourite. Hopefully you will be inspired by the way I used traditional Christmas and Wintery kits in a non-traditional way. Enjoy thinking outside of the box and playing with products, because it’s fun.